In case you haven’t heard, Nick Offerman is a man’s man. Through the slow melding of his own personality with that of his Parks And Recreation character Ron Swanson, Offerman conjures up archetypes of push broom mustaches, woodworking, emotional restraint, and whisky. 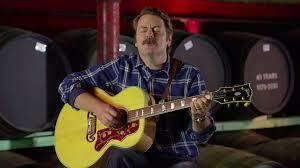 Fans of Offerman, Swanson, and Scotch whisky will enjoy his tribute to the delicious brown liquor. (For the uninitiated, whisky without an “e” generally refers to Scotch whisky, and whiskey with an “e” refers to Irish and American whiskey, including bourbon.) Keen eyes will discern a bottle of Oban, a classic Highlands scotch, and the distillery for Lagavulin, a favorite choice for discerning fans of peaty Islay scotch.